Stir the chicken, celery, dressing and hot pepper sauce in a medium bowl. Cut each bread slice diagonally into 2 triangles. 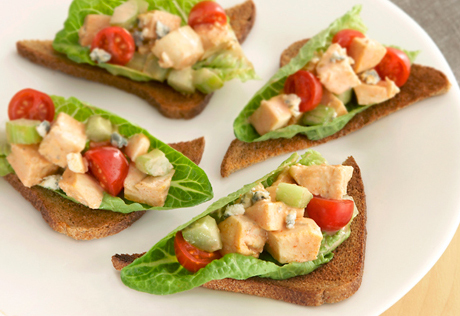 Top each bread triangle with 1 leaf lettuce, 2 tablespoons chicken mixture and about 1 teaspoon blue cheese. Top with the tomatoes.